Being a mom whose more than just a mom. Finding identity and purpose in Christ. Living and loving while in the midst of the messes of growing up. Plus, Ohio. Did you pick a word to focus on for 2019? 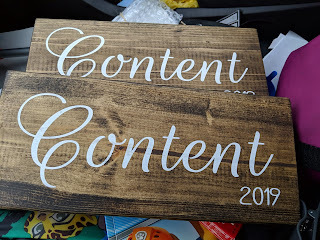 My word of the year for 2019 is "content". My goal for this year is to being satisfied with my life as it is. As a recently divorced single mom that could be a challenge. But nothing is impossible with God. And God is my center. I have this picture in my mind that I am in standing on a rock in the center of His palm in a posture of trust and worship. I'm more than just a mom, I am more than a title, more than a stereotype. I am a follower and co-worker of Christ.